The effects of stress on the body are vast. When do most of us pay attention to our bodies? Usually when something starts to hurt or not work properly. If you think of your whole body as a house, most of us stressed out people tend to spend the majority of our time in the attic. Don't get me wrong, attics can hold many wonderful things: decorations, old pictures…But, attics can also collect cobwebs, dust, and scary, creepy crawlies. I would classify anxiety as a scary, creepy crawly. Stress likes to move out of the attic into the rest of the house. It often shows up as a headache, tummy ache, back ache, rash, erectile dysfunction, etc. Unfortunately, most people like to treat symptoms with creams and pills without treating the underlying cause of the problem. The mind and body are inseparable. Taking care of both the mind and the body is crucial to overall health. Every single system in our bodies is effected by stress. If the stress is short term, there's no problem. We are wired to protect ourselves from danger, and short-term stress is how we do that. But when there are several stressors particularly intense ones or it is over a long period of time, it adds up to be a factor that can damage our health. Not all of the effects of stress on the body are bad. In fact, a normal physical stress response ensures motivation and survival. When we perceive a threat, real or imagined, our body goes into the automatic process known as "fight or flight" (a.k.a. the stress response). When you need to deliver a big presentation at work, the stress response helps you pay attention to your audience, rather than make your grocery list in your head. In the short-term, the effects of stress on the body can even save your life. For instance, you would gain extra strength to either defend yourself or escape from an attacker. When a danger is perceived, your nervous system releases stress hormones, such as cortisol and adrenaline. These hormones sound the emergency alarm system in your head that says, "Wake up!" Your reaction time becomes shorter, your speed faster, your breath quicker, your blood pressure higher, your heart rate faster, and your senses sharper. These effects of stress on the body prepare you to either fight or flee the danger you perceive. It's amazing how the stress response safeguards us. The increased blood pressure and heart rate allow more oxygen and blood sugar to be delivered to important muscles. The increased sweating cools the muscles to ensure peak performance. Adrenaline and cortisol make sure blood is concentrated at the core of our bodies so that blood loss is reduced if our extremities are damaged. The stress response occurs anytime we are in danger, but also occurs when we are surprised or frustrated. The effects of stress on the body are proportionate to the intensity of the perceived threat. So, when the threat is small, the stress response is small. When the "fight or flight" response becomes chronic, however, you are at risk of burnout and health problems. The physical effects of stress are rampant. Stress is such a common word today. If you think about it, you have probably used it at least once this week, or was it more than once today? Why do we talk about it so much? The reason is simple: people are pulled in too many directions and have too many demands on their time, their finances, their physical strength, their mental ability and emotions. Another reason for the amount of internal pressure in today’s world is the lack of solitude and quiet. Many people live alone but have constant input from some form of media or technology. Finding time and space for quiet and reflection is often a challenge or completely missing from one’s life. All of this adds up to physical effects of stress on our bodies. Some of it is unavoidable. You move to a new city. You change jobs. Your child is sick. These are things largely outside of your control. But, some of it we can control ,if we recognize the need. Let's take a closer look at the effects of stress on the body. This information may motivate you to take action and make some changes to take the pressure off yourself and protect your health! Stress can lead to breakouts and even itchy rashes and hives in some people. From being in a blue or irritable mood to more serious mental issues like depression, your emotional health suffers when there’s stress in your life. Women are better than men at hiding some emotions like anger and aggressiveness because the parts of their brains responsible for these emotions are larger than men's, but depression strikes women twice as often as men. 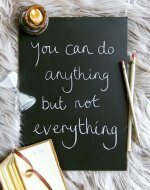 Stress makes it hard to focus and be effective in your responsibilities at home or work, and that can compound your problems if your stress comes from your job to begin with. 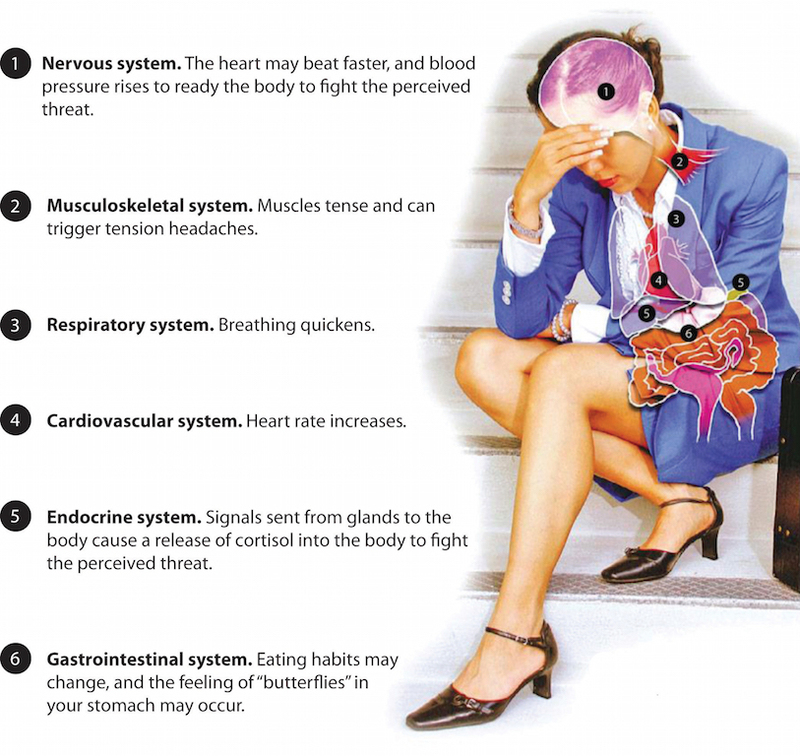 Stress hormones affect your respiratory and cardiovascular systems. During the stress response, you breathe faster in an effort to distribute oxygen and blood quickly to your body core. If you have preexisting respiratory problems like asthma or emphysema, stress can make it harder to breathe. Your heart also pumps faster. Stress hormones cause your blood vessels to constrict and raise your blood pressure. All that helps get oxygen to your brain and heart so you’ll have more strength and energy to take action. Frequent or chronic stress makes your heart work too hard for too long, raising your risk of hypertension and problems with your blood vessels and heart. You’re at higher risk of having a stroke or heart attack. Under stress, your liver produces extra blood sugar (glucose) to give you a boost of energy. Unused blood sugar is reabsorbed by the body. If you’re under chronic stress, your body may not be able to keep up with this extra glucose surge, and you may be at an increased risk of developing type 2 diabetes. The rush of hormones, rapid breathing, and increased heart rate can upset your digestive system. You’re more likely to have heartburn or acid reflux. Stress doesn’t cause ulcers — a bacterium called H. pylori does — but stress may cause existing ulcers to act up. You might experience nausea, vomiting, or a stomachache. Stress can affect the way food moves through your body, leading to diarrhea or constipation. I hope this information kind of scares you the way it does me. It's time to manage stress. You're not going to magically make stress go away, but you can regain control over it before it controls you! Stress, You Don't Feel Good...Go Away!